Description: dir. Trisha Ziff, 2008, Mexico / UK, 90 min. Chevolution is an essential documentary because it serves to explain the enigma of Ernesto “Che” Guevara, providing a rich emersion into the history of the man, the icon, and the culture that seem to interweave and betray historical accuracy. The film explores the Che “phenomenon”, including the revolutionary’s early life, his fateful encounter with Castro, and his involvment in the Cuban Revolution. It also examines how he crossed paths with Alberto Korda, the fashion photographer who took the famous picture of Guevara that is the basis of the icon we know today. No other photograph in the history of photography has been reproduced throughout the world quite as extensively as that of one man, who, even fifty years later, continues to be prevalent and holds different meaning to various people. Driven by inquisitive minds and exquisite filmmaking, Chevolution asks all the right questions with mordant wit and irony. Chevolution es un documental esencial para aclarar el enigma de Che Guevara, al tiempo que nos sumerge en su historia, en la famosa imagen y en la cultura que entreteje y traiciona la realidad historica. El film explora el “fenomeno” de Che, incluyendo el inicio de su vida revolucionaria, el encuentro profetico con Castro y su participacion en la Revolucion Cubana. 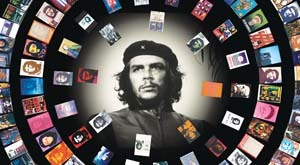 Tambien examina su encuentro con Alberto Korda, el fotografo de moda, quien tomo la famosa fotografia de Che Guevara que fue la base de la imagen iconica que conocemos. No ha habido otra fotografia en el siglo veinte que haya sido reproducida tan extensamente en el mundo entero que cincuenta anos despues continue siendo prevalente y signifique tantas cosas diferentes para tanta gente diferente. Conducida por mentes inquisitivas y exquisitamente filmada, Chevolution hace todas las preguntas correctas con ironia y caustica agudeza.